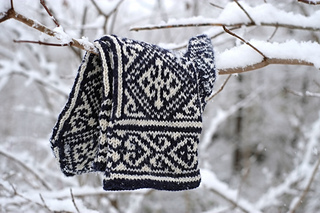 This pattern is available in Finnish, but should be very easy to follow, because in the pattern a chart is included and every st is represented in the charts. 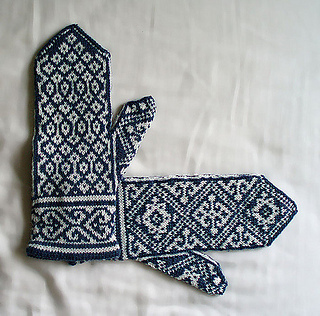 Palm sides and cuffs of both mittens are similar, but thumbs (incl. thumb gusset) and the knuckle sides are different. 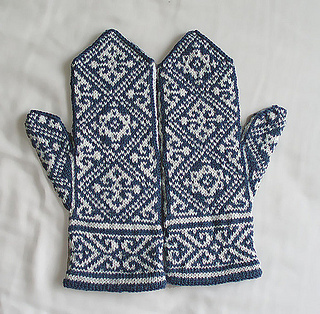 Charts for these are included, so if you have knitted stranded mittens before, these should be fairly easy to knit. However, should you encounter any problems, let me know and I’ll try to help. 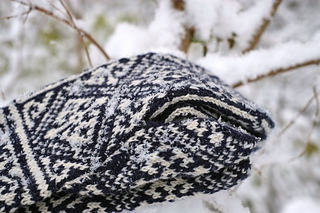 The cuff is knitted as follows: CO the 60 sts, knit a few rounds in stockinette, purl one round, and then continue knitting the cuff as described in the chart. When finishing, the 5 row “lining” of the cuff will be turned to the WS and sewed to the inside of the cuff. Any CO method you like will work with this type of cuff. I normally use either long-tail cast on method, or, sometimes, the provisional/invisible cast on method. 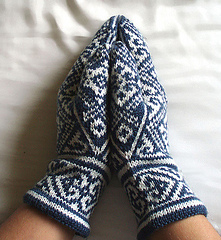 If I use the latter, I pick up the CO sts and knit them together on a row in cuff. 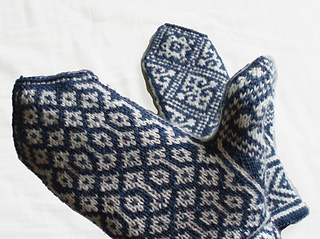 For this technique, see TECHknitter’s wonderful tutorial. If you use the long-tail cast on method, you can leave a longer tail and use it for sewing later. 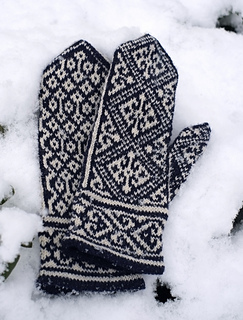 Thumb and thumb gusset: On the first row of the gusset, increase 2 sts on both sides of the middle st. The middle st is in the chart merely for reference and it is the stripe between the palm and hand sides of the mitten, and after the finished gusset and placing the sts of the thumb on holder, you will replace this one “missing” st by casting on one st and that’ll become the new stripe st.
Edit: Ohjeessa neuvotaan luomaan 60 s. Jos neulot kolmella sukkapuikolla, silmukoita tulee jokaiselle puikolle 20, kuten ohjeessa sanotaan. Lapaset voi tosin neuloa millä hyvänsä pyöröneulemetodilla, silmukkamäärä/puikko on ohjeellinen.